Over the centuries theories have abounded about what really happened to the Holy Grail. Did it exists at all? lf it did what actual form did it take? What effect did it have? ls it's continued existence important to Christian beliefs? lf it did exist who had it and where did it go? Plays and books have been written about it; TV documentaries have been produced and award winning films made explaining it's 'true' meaning. In the upshot, who can tell? And is it important? In tonight's play the harassed Inn Keeper and his upwardly mobile wife bring their combined brainpower to the issue. It's always very difficult to produce something which deals in a realistic fashion with issues surrounding such apparently cataclysmic events such as those which surrounded the crucifixion of Jesus. There is a balance to be struck between a performance which portrays the overwhelming sadness and despair of those most closely associated with Jesus and his ministry, and in seeing things through the eyes of officials and of the ordinary citizenry of the time who went about their everyday affairs whilst the events were unfolding. Where did these diverse sections of the community actually meet? At what point could questions be asked and answered? How could those who were followers re-kindle their faith and direction after being so crushed? 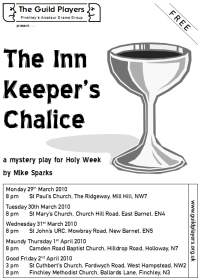 In our play tonight we offer some possible answers to these questions when our actors bring you The Inn Keeper's Chalice - the latest in the author's series of Inn Keeper's Tales.